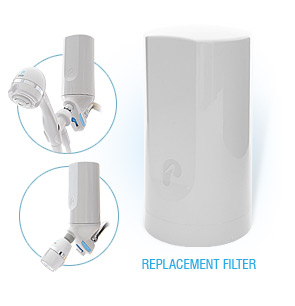 Replacment Filters for NEW Pelican Shower Filter. FITS ALL PELICAN SHOWER FILTERS WE OFFER. INCLUDES KDF, Granulated CARBON and Far-Infrared Volcanic Media. FREE SHIPPING IN LOWER 48 STATES. EMAIL US for other shipping rates. Filter targets chlorine. Will also reduce other contaminants. Most appropriate for municipalities using chlorine. Fits all the Pelican Shower Filters we offer. Most chlorine is removed. This top-quality shower filter will also reduce herbicides, pesticides, chlorination byproducts, lead, copper, mercury and other heavy metals. Somewhat softens water naturally. Please note: The primary risk of fluoride is from ingestion. Fluoride does not release into the air to be breathed in, like chlorine and chloramine. Not is it readily absorbed through the skin like them. The primary risk from showering is the disinfectant. For information on chlorine, click on: Chlorine . Filters chlorine and other contaminants from your shower water. Includes a special blend of steam activated carbon media. 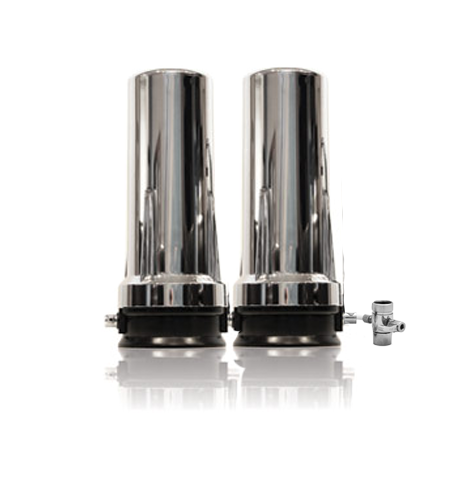 This is designed to filter out synthetic chemicals and unpleasant odors. Your water will smell fresh and clean. Far-Infrared emitting volcanic media induce reduced or negative ions into the water. This results in lower surface tension in the water allowing for better hydration of hair and skin. This also makes the water feel softer on your hair and skin. reduction of free available chlorine by KDF Fluid Treatment Laboratory.